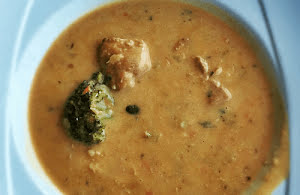 Savor this delicious, spicy, and fulfilling smoked chicken soup enhanced with chunks of chargrilled broccoli florets which give it a unique taste and aroma. Chargrill all the broccoli florets on an open grill and keep aside. Heat olive oil in a large pot on a medium flame. Add garlic paste to the pot and stir-fry for a minute. Add finely minced onion and continue to stir fry for another two minutes. Add smoke chicken cubes with a splash of white wine. Toss and cook for half a minute. Add Worcestershire sauce, cayenne pepper, dried herbs mix, light soy sauce, and ground cumin to the pot. Gently stir-fry for about 2 to 3 minutes. Add chicken stock as well as heavy cream to the pot. Switch the flame to low-medium and close the pot with a lid after gently stirring for half a minute. As soon as the soup comes to a boil, switch the flame to low and simmer for about 8 to 10 minutes. Mix cornstarch within 1/3 cup of lukewarm water and add to the pot. Continue simmering the soup while stirring gently for about 2 minutes. Season with ground black pepper and kosher salt. Simmer for another 2 minutes and bring down from the flame. Add chargrilled broccoli florets to the serving bowl filled with piping hot soup.